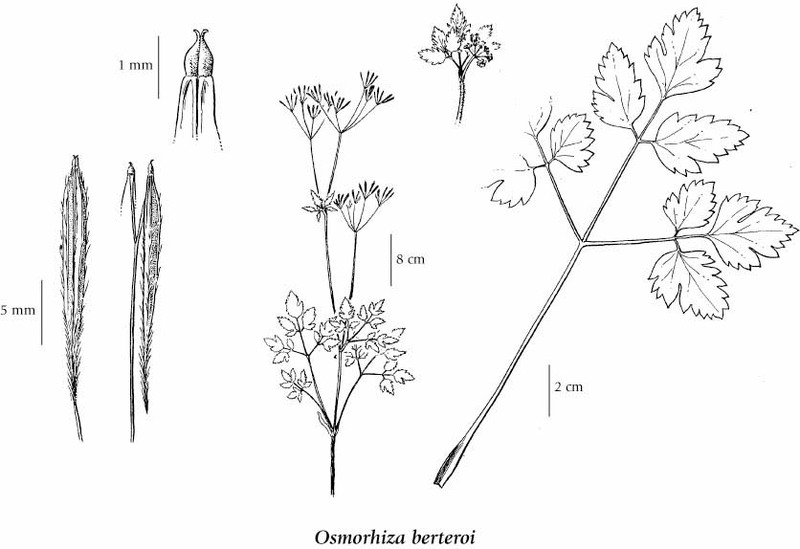 Perennial herb from a well-developed taproot, sometimes below a slightly branched stem-base; stems solitary or sometimes 2-3, 0.3-1 m tall, branching. Basal and stem twice divided into 3's, leaflets coarsely toothed, 2-9 cm long, 1-5.5 cm wide, more or less hairy, thin; basal leaves several with long stalks; stem leaves 1-3 with short stalks. Inflorescence of loose compound umbels; flowers greenish-white, sometimes pink or purple, inconspicous; stalks short when flowering becoming longer at maturity; involucels lacking. Linear-oblong, needle-like, 12-22 mm long, black, bristly hairy basally, narrowing to a beak, often catching on clothing or fur. Mesic open forests and forest margins in the lowland and montane zones; common throughout BC; N to AK, E to NF and S to SD, CO, AZ and CA, disjunct to S. America. 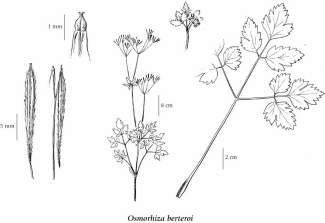 Osmorhiza brevipes (J.M. Coult. & Rose) Suksd.